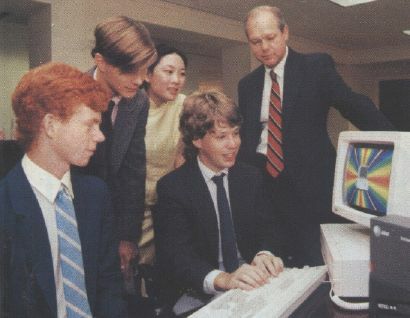 The Collegiate Schools of Richmond, Virginia, recently won the 1990 Texaco Star National Academic Championship at Rice University in Houston. Each team member took home an AT & T personal computer and a gold championship ring. In addition, the team as a whole received a $50,000 scholarship from the Texaco Foundation. Watching as teammate Billy Braoddus (seated) tests one of the new PCs are (left to right) team members Eric Biber, Peter Hopewell, Joann Chan, and AT & T Computer Systems Area Manager Larry Yocum. If you've been waiting with bated breath for TV Sports Baseball, you might want to give it up and switch to ESPN. Although the program has been advertised for months, Cinemaware says it won't be on retail shelves for a while yet. "We've pulled development back in-house so that we can make enhancements to the program," said Sam Pool, a Cinemaware spokesman. He said the company wants to add a number of features to the program to ensure that it meets the standards set for the TV Sports line. Cinemaware currently plans to release Amiga and MS-DOS versions of the program in April 1991. Meanwhile, Beyond Software, an independent game developer that did early work on TV Sports Baseball, filed a $20 million lawsuit against Cinemaware last July. Beyond Software claims that Cinemaware relinquished its rights to the baseball game when it canceled Beyond's development contract. "In the end, we know we're the ones who designed the game and that we own the rights to publish it. We need the help of the legal system to get the truth out in the open," said Beyond's Don Daglow. Pool said that the dispute between the two companies is currently being handled through contract arbitration, and he doesn't anticipate that it will delay the release of TV Sports Baseball. Maybe we'll see it by spring training.